St. Louis-based Peabody Energy will again trade on the New York Stock Exchange beginning on Tuesday, as they announced that they're emerging from bankruptcy. It will be under its old ticker symbol BTU, but company officials are calling it a new day. “We believe that ‘The New BTU’ is well positioned to create substantial value for shareholders and other stakeholders over time,” said Peabody President and CEO Glenn Kellow in a press release. The coal company says it shed about $5 billion in debt from the time it filed for Chapter 11 in April 2016. While coal prices have rebounded somewhat over the last six months, many analysts say natural gas remains a strong energy competitor. Charles Dayton is vice president of market analytics at St. Louis-based Doyle Trading Consultants. Still, Doyle said Peabody is emerging with much lower financing costs, especially in its Australian mines. In its press release Peabody officials said its capital structure was designed to withstand cycles. “Our financial focus will now be on reducing debt, targeting high-return investments and returning cash to shareholders over time,” Kellow stated. 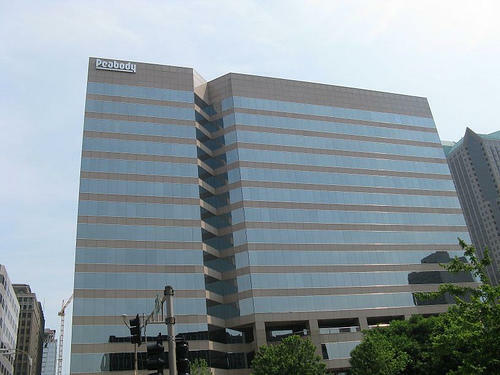 A federal bankruptcy judge in St. Louis denied a motion Thursday to give shareholders in Peabody Energy an equity committee that would represent their interests during the coal giant’s bankruptcy. Judge Barry Schermer delivered his ruling after the hearing, and said the cost of creating an equity committee was not justified if there was no equity to offer shareholders. Peabody’s reorganization plan, released in December, calls for zeroing out shareholders’ equity. Peabody Energy is mapping out its plan to emerge from bankruptcy protection next spring. The coal company has filed a financial reorganization proposal with the U.S. Bankruptcy Court in St. Louis that calls for shedding more than $5 billion in debt and eventually issuing new common stock. Current shareholders would not receive anything and might oppose the plan. St. Louis-based Peabody Energy will set aside part of the funding it promised toward future mine reclamation in Illinois. The coal giant reached a settlement with the Illinois Department of Natural Resources this week. The agreement puts “super-priority” status on $12.9 million for mine reclamation in Illinois, placing that funding ahead of other entities with claims in Peabody’s bankruptcy suit. The motion for the agreement will be heard by a federal judge on Sept. 15.